As I mentioned earlier this week, we recently had an Olaf/Frozen themed birthday party for my three year old nephew. We made a point of coming up with delicious and creative dishes that could represent frozen or icy objects, and even made plays on words to come up with some hilarious names for the food. 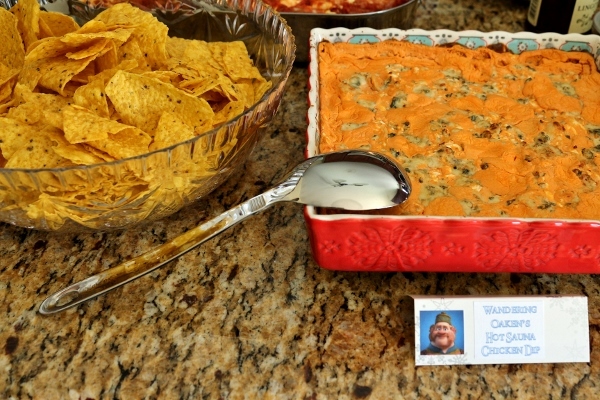 The most random and probably funniest title we came up with was Wandering Oaken's Hot Sauna Chicken Dip. 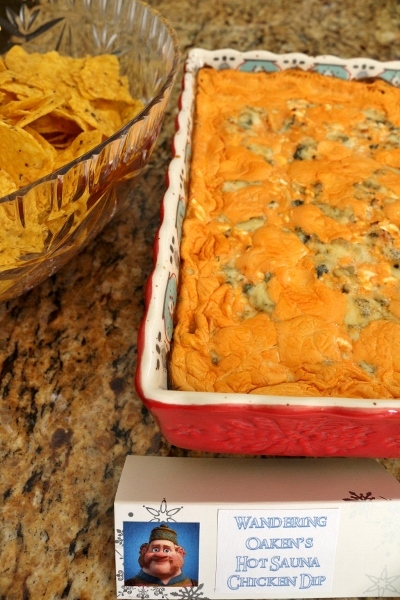 I knew I had to make something with Buffalo chicken for the party, and I decided on a dip. Since spicy food doesn't really represent Frozen in any way, we used the only character associated with something hot--Wandering Oaken ("Yoo-Hoo! Big summer blowout!"). I have created A LOT of dishes using Buffalo chicken over the years. 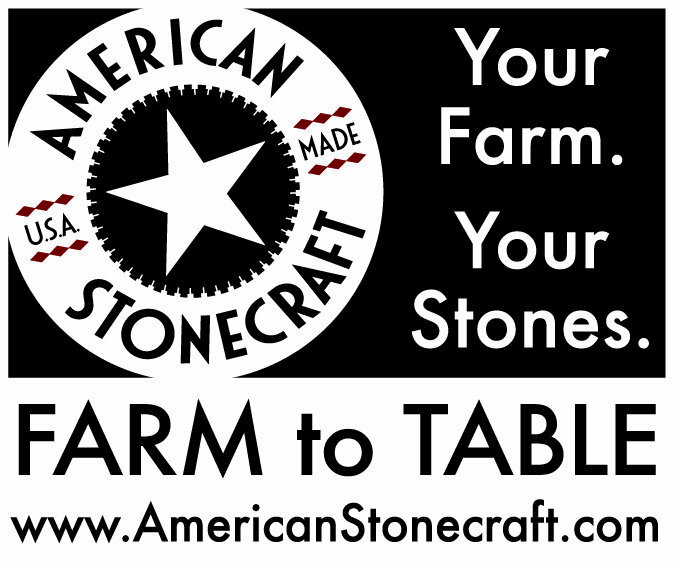 It's one of my favorite flavor profiles, and it perfect for so many occasions (not just the Super Bowl). If you're into hot wings, then you can enjoy Buffalo flavors throughout the year. 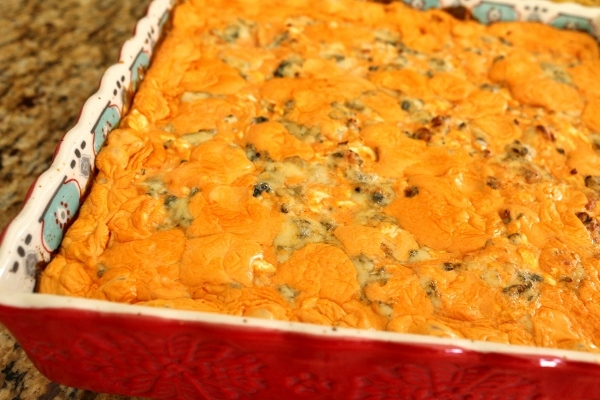 Buffalo chicken dip is not a completely novel idea, but many of the recipes I've seen use canned chicken. I don't know about you, but to me canned chicken is seriously unappealing. Using some leftover rotisserie chicken, or even cooking a chicken breast from scratch is not that difficult. There's no reason to used canned chicken when you can use REAL chicken in this recipe. 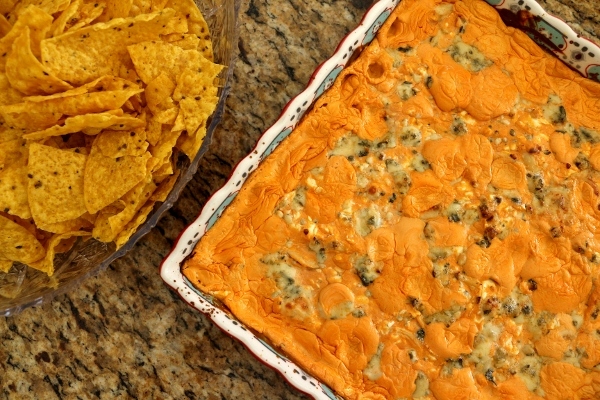 This dip is creamy, spicy, and perfect for any Buffalo chicken-lover. I like it best served with tortilla chips, but celery sticks are great too and offer a cool crunch to an otherwise spicy snack or appetizer. I actually made double the recipe for our party, so the photos showcase more than what the recipe below will make. It is very easily doubled, but since not everyone will make this dish to serve a large crowd, I kept the recipe below at it's minimal quantity. It still makes a decent amount, but feel free to double it if you're having a party! Preheat the oven to 400 degrees F and lightly grease a small 1 quart baking dish. 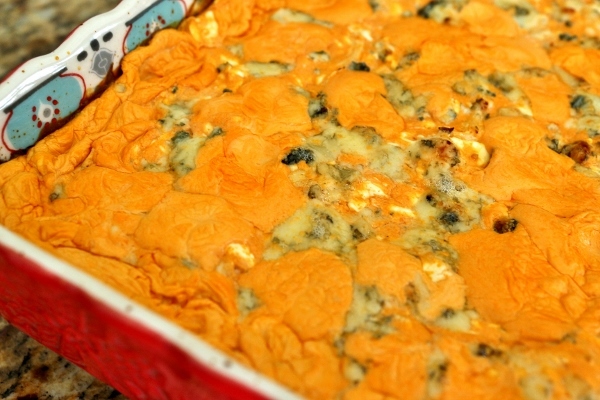 In a large bowl, whisk together the softened cream cheese, hot sauce, and blue cheese dressing until smooth. Fold in the shredded chicken, and then transfer the dip into the baking dish. 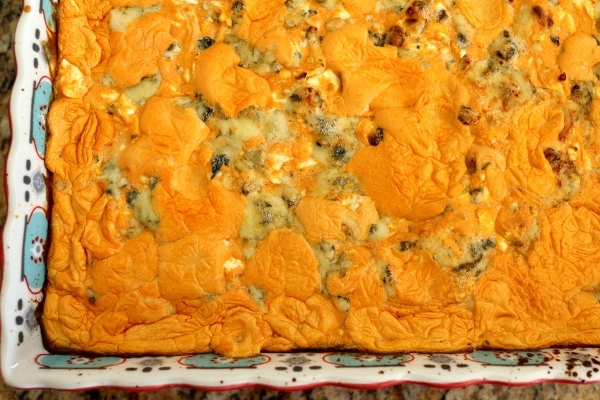 Top with the crumbled blue cheese and bake for 20 to 25 minutes until bubbly and heated through. Serve immediately with celery sticks, tortilla chips, and/or crackers. 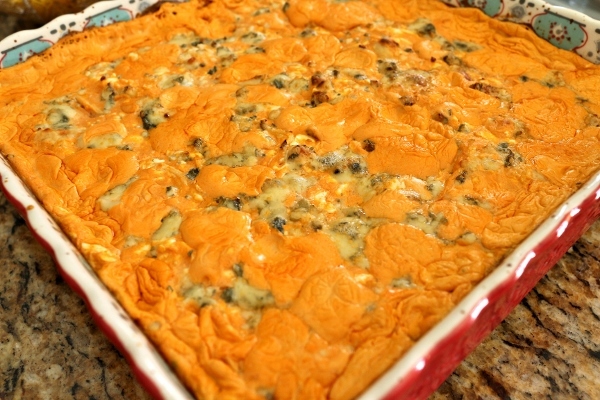 *Note* The photos in this post are of a double batch of this dip baked in a shallow 2 quart baking dish.